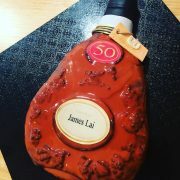 This cake is for a client’s 50th birthday. It was quite a challenge of making this cake. Because our client are Asians, and they don’t like a cake that’s too sweet, so we wanted to make a mousse cake, and it’s for about 20 people to share. 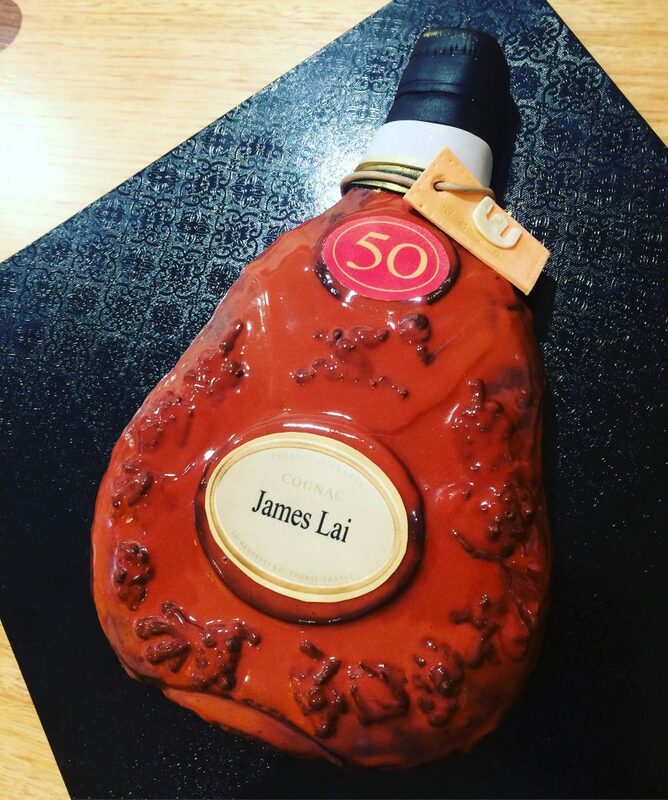 We’ve made a sheet of brownie, and a layer of chocolate coffee mousse and mango jelly, layered on top of the brownie, and carved into the shape of the XO bottle. During this, we need to carve and freeze, carve and freeze the cake for 3 times as the mousse will become soft if in room temperature. After 2 hours of shaping, it finally in the shape that we both happy with. Now is the next challenge: glaze it into XO dark red, which is really unpredictable, it’s a total experiment to us, and we finger crosses for the best outcome! And it came out pretty well…. we used white chocolate mirror glaze dyed into red and waited til the right texture and just pour it on! Wait til it’s set, we put the rest of the opponents on, the cap, tag and string. The whole process took about 4 hours, but the most frustrating thing is the unknown, but we are pretty happy with the result, and our client (WACO) were very happy too, lots of photos and the cake didn’t last for very long at all.